This article brings a discussion about using the Cost Deployment methodology for technological innovation in the World Class Manufacturing (WCM) systems at Fiat Group Automobiles Production System (FAPS). It aims to show how this tool acts in the technical pillars of the WCM, and its proper use as an alternative to innovate in production processes, achieving a drastic reduction in wastes and cost optimization during specific activities in production systems. The Cost Deployment builds a distinctive transversal method of WCM which helps to promote and provide extremely effectiveness in the activation of more specific methods that have been tried successfully in the Japanese manufacturing improvements. It also allows to link the operational performances, usually measured with indicators such as efficiency, providing number of defects, hours of desaturation. The used methodology was based on a literature review about the proposed topic. It ends up finding that the Cost Deployment tool is one of the most sophisticated technological innovations existing for the production systems of the World Class Manufacturing. In the current scenario, the process of industrial system modernization is linked to the technological innovation and new technology of products, processes and services, demanding from companies a continuous seeking for innovation in their activities and production systems. Companies aim to increase optimization of costs, as well. In the role of these new parameters in the industrial sphere, many companies from various sectors have been involved in rethinking their old forms of production. The Cost Deployment is a distinctive and transversal method of WCM which helps to promote and provide extremely effectiveness in the activation of more specific methods that have been successfully tried in the Japanese manufacturing improvements . The used methodology is based on a literature review about some concepts on Technological Innovation, World Class Manufacturing, production systems at Fiat Group Automobiles Production System, and Cost Deployment. Considerations were discussed about the main relationships among the themes in order to explain its importance in the production chain. The World Class Manufacturing is a set of concepts, principles and techniques for managing the operational processes of a company. The term World Class Manufacturing effectively captures the essence of the fundamental changes taking place in world industries in the 1970s in a very wide set of elements that characterize the production: quality management, industrial relations, the training, support staff, sourcing, relationships with suppliers and customers, product design, organization of establishments, the scheduling, maintenance, production line, the accounting system, automation and others . The WCM is based on models created by the activities of Japanese manufacturing after World War II and the results obtained by the Japanese approach in order to organize production. It adapts the ideas used by the Japanese in automobile and electronics sectors to achieve significant competitive advantages. The WCM was first presented as an organic approach by Schonberger . It shows a series of American companies which have adopted and implemented the Japanese approach to production, adapting it to the Western context. From the text of Schonberger  it is possible to identify that this adaptation has not occurred by pure imitation, but the adoption of the Japanese ways of producing in the West helped to publicize a very different approach. However, these changes generate a need for creating continuous technological innovations stimulated and generated by people in companies, aiming to manage and keep working in the current competitive environment. In a highly competitive market, with production processes filled with organizational bottlenecks, the generation of innovations becomes critical in this process; organizations can continuously improve their processes through products and services. Innovation is an evolving set of new evolutionary functions that change the production methods, creating new ways of organizing work, and in producing new products, stimulating the opening of new markets by creating new uses and consumptions . Following the same analysis Canon , relates that the concept of technological innovation can be understood as the expansion of production (more machines) and the increase of new products. In other words, it means that the company should think about producing products which have been produced by other manufacturers or competitors. In this same perspective, innovate is create and is also improving in products or processes that are working or can make a good profit. Innovate is to produce what the company did not deliver before. Innovation is expanding industrial sheds, is to install more machines, and is to install more modern machines let that to produce more quantity of products. Many times is to increase the productivity and optimize costs, mostly is to increase the production. Therefore, technological innovation must be undermnstood as an activity that involves not only the industry in research and development in an organization, not even as an activity performed only by large companies. It must always be presented in all companies wishing to act in an innovative and competitive way in the market . There is no consistent definition of WCM, as many other new concepts related to management and supply chain. The term “World Class Manufacturing” was created by Hayes & Wheelwright  and Schonberger , to describe the technological capabilities that had been developed by Japanese and German companies, as well as U.S. companies that had competed on equal terms with Japanese and German companies. The term WCM was used because these companies have achieved an outstanding performance in their global competition, resulting in the concept described as “World Class”. However, the term became popular only after Schonberger  discussed the issue as: “[...] The term captures well the breadth and the essence of the fundamental changes taking place in industrial companies.” WCM is a major philosophies focusing primarily on production, with a level of excellence throughout the logistics and productive cycles, in reference to the methodologies applied and the performances achieved by the best companies worldwide, mostly based on the concepts of Total Quality (TQC), Total Productive Maintenance (TPM), Total Industrial Engineering (TIE) and Just Time (JIT). It is noteworthy that the critical factors of WCM success during the recent years have received widespread attention. It also became one of the driving forces for business success. Huczynski and Buchanan , EscrigTena , Flynn et al. , McAdam and Henderson , Oakland , Salaheldin and Eid , Sharma and Kodali , Sinclair and Zairi , Sohal and Terziovski  and Svensson and Klefsjo  conducted extensive studies to understand the factors that strengthen and enforce WCM application. These cited authors concluded that companies need to understand how to identify the critical factors which affect the implementation process by analyzing their tools in order to solve them effectively. This procedure ensures that benefits can be realized and established so faults can be drastically avoided. Therefore the need for a more systematic and deliberate study on the critical factors of success on implementing WCM is still considered fundamental. Critical factors of success can be defined as areas where things should go well for the business to flourish, Butler and Fitzgerald , Digman , Eid et al. . Oakland  highlights the importance of observing such critical areas in which the organization must have a greater attention to achieve the organization’s mission, through examination and classification of impacts. In terms of WCM, they can be viewed as the activities and practices that should be addressed to ensure its successful implementation. According to Sinclair and Zairi  the quality department plays a key role in implementing WCM, since proper training is provided to this department, EscrigTena , McAdam and Henderson . However, the support of the senior management team is essential to integrate systems with the implementation plan for WCM, Avlonitis and Karayanni, , Mora-Monge et al. . Bose  reinforces that programs of people awareness management are important for WCM implementation. In the current literature, there is a considerable discussion about the importance of the human dimension in WCM implementation. It is taken as a facilitator of the process, not just an adjuvant, Flynn et al. . Sureshchandar et al. , Oakland  and Sinclair and Zairi  also added the factor of continuous improvement for effective implementation. Finally, Dubrovski  and Kasul and Motwani  indicated that for a successful implementation of WCM, an integration of the entire company is required. As defined by Massone , responsible for Production System Development of Fiat Group Automobiles Production System (FAPS), the introduction of FAPS concept is a great program of technological innovation that has the intention to change profoundly the way of producing, in order to achieve the standards of excellence set by the World Class Manufacturing (WCM). For Professor Yamashina, cited by Massone , from the University of Kyoto, the basic and fundamental principle of WCM with FAPS is to bring the man to the entire production process to think and act effectively, and each time, act like men’s of thought and think as men of action. The model of Fiat Group Automobiles Production System (FAPS) is a structured set of methodologies and tools whose application spread across the enterprise through the involvement of all employees. It allows a radical improvement for the performance of the production system, optimizing all production processes and logistics working in continuous improvement of key factors: Quality, Productivity, Security, and Delivery. The implementation support is done by a system of Audits and it is structured by goals whose achievement is measured by performance indicators . This allows the product to be delivered within the required time and quality, simultaneously eliminating activities that generates losses and do not add value (manpower, machinery, materials and energy). 11) Environment—It is the development of activities in a sustainable working environment for all in the organization, concerned with the prevention of environmental pollution. The technical implementation of the 10 pillars of WCM in the production system of FAPS had as main objective to pursue a mental attitude or relevant philosophy to their scope and its improvement, following a well-defined path based on the removal of all barriers concerning production to achieve maximum simplification. There are many indications showing which obstacles should be eliminated in production and which routes should be followed for the simplification . However, the production system of FAPS, which itself is based on WCM, becomes a formidable element of competitiveness for enterprises, and an important and lasting contributor to improving customer satisfaction. Cost Deployment is a method that innovate systems management and control of establishments, introducing a strong link between individualization of the areas to be improved and the results of the performance improvements obtained through application of technical pillars of the WCM, measured through the appropriate KPI . Consequently, it constitutes a reliable means to program budgeting. 5) The continuous monitoring of progress and results of improvement projects. Cost Deployment is the ability to transform losses costs, quantifying in physical measurements: hours, kW/h, unit numbers of material, etc… . The foundation of the methodology is the systematic identification of waste and losses of the area under examination, its evaluation and transformation into values. This is possible because it relates waste and losses to their causes and origins, allowing a complete definition of the loss. In addition, Cost Deployment guides the individualization of the best technical method to remove the cause and assess in detail the activity costs of removal and improving performance . Figure 1 shows the detail of the logic route of Cost Deployment. 7) Finally, improvement plans are implemented by collecting the results (step7) following them up. Figure 1. Logic route of cost deployment. serve to set priorities to make value-added activities of steps 5 to 7 really effective. The first three steps are specifically designed to calculate and quantify the losses from the establishment budget data and establishment costs and from the operating data, as well. The fourth and fifth steps aim to define the economy program, through the layering of economies in terms of costs and impacts for the improvement of relative KPIs. This stands as the definition of projects plan. The sixth and seventh steps are intended to ensure the reporting and monitoring of results analyzing the quarterly progress of operating performance and the calculation of savings in costs and improvements. 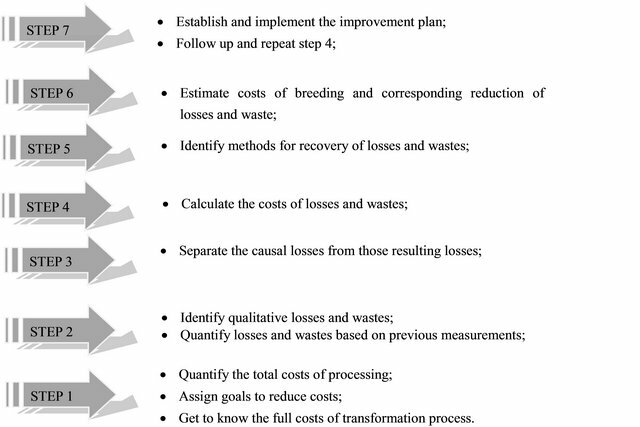 After the completion of step 7, Cost Deployment activities should start at step 5, again taking into consideration the matrix A and the costs and losses, with the purpose of selecting other losses which had not been evidenced before because of resources lack, bad judgment, etc. This procedure permits these losses to be attacked with other projects then. In the case of lack of resources, they can be provided from previous projects. The losses and wastes that occur during the execution of a production process are allocated to machines, people and materials. Cost Deployment aims to determine the individualization of what is a loss and what is a waste, as well as its measurement, and the distinction between resulting cause and root cause. In a production process which is characterized by generating an output from an input, the efficiency is the ability to produce an output (constant) and at least one input, so waste is defined as an excess input. As the efficacy is given by the ability to produce a maximum output with a constant input, the loss is defined as unused input. In the imposing of Cost Deployment, first it’s important to consider that in a production process 18 significant losses can be identified. They are grouped in terms of personnel and materials/energy . Huge losses tied to machines operation are identified as losses that have impact on the overall efficiency of the equipment and as time losses, the time the equipment is off. Regarding machines losses, Deployment Cost cannot always be seen immediately especially when a particular piece of equipment is critical in terms of effectiveness. By the way, it may be useful having Overall Equipment Effectiveness, OEE, as a reference. It lets to visualize equipment losses structure, taking into consideration technical efficiency, management and quality. OEE is an indicator that measures the overall rate of quality, the efficiency of delivery and the technical availability of the machine . Figure 2. The seven steps of cost deployment. 4) Losses of equipment which have no impact on OEE: losses are attributable to loss of time and theoretical availability of equipment. 4) Losses committed by employees affecting quality: rework, lack of automatic control, measurement and implementation, human errors. Deployment Cost goes deeper. It considers not only resulting in losses as in the traditional way of managing the manufacturing, but also it tries to search for the cause of such losses. For example, loss of manpower can come from downtime that may have been originated from problems with components. These events may be originated in processes or sub-processes even though they were indirectly affected . Therefore, the application of Cost Deployment in the technical pillars of Fiat Group Automobiles Production System allowed a strong acceleration of the results and the achievement of important advantages in reducing losses. This method is the compass that directs and guides continuous improvement projects . Industries are not unrelated to the changes that are occurring in the current competitive scenario. However, some management leaders who are part of the same scenario have not given proper treatment for issues related to the specificities of each organization . The philosophy of World Class Manufacturing (WCM) has proven to be sophisticated and efficient in order to operate in highly globalized and competitive markets, and that their current innovation process, Cost Deployment, radicalized the optimization of production costs and logistic processes. 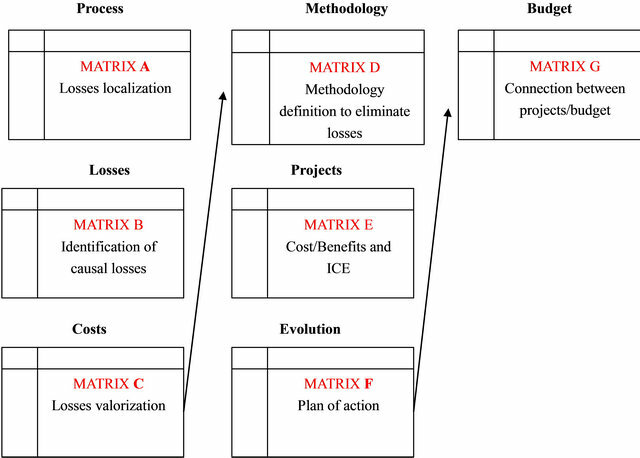 By analyzing Cost Deployment methodology, it was possible to understand that it also allows linking operational performances which are usually measured with indicators such as efficiency, providing numbers of defect, hours of desaturation, etc… Normally, these indicators are non-comparable among them or with economic performance. They are valued at cost providing a common language to institutions allowing effective definition of the priorities for improvement. Cost Deployment methodology also enables focus on areas where the greatest casual losses are placed providing opportunities for greater efficiency and effectiveness in reducing and eliminating them. It also facilitates the selection of methodologies and technical pillars to be activated in order to remove or correct the causes of such losses, allowing an easy evaluation of costs and benefits . To face this new challenge of implementing Cost Deployment in operating activities of WCM, Fiat Group Automobiles Production System (FAPS) must be always innovating and successively acquiring new organizational knowledge in order to always present a competitive posture. Therefore, it is necessary to create a proper environment to create and implement innovative, flexible and non-rigid structures operational processes. H. Yamashina, “Just-in-Time Production—A New Formulation and Algorithm of the Flow Shop Problem,” Computer—Aided Production Management, Vol. 34 No. 3, 1998, pp. 120-140. L. Massone, “Fiat Group Automobiles Production System: Manual do WCM, Wold Class Manufacturing: Towards Excellence Class Safety, Quality, Productivity and Delivery,” Ed. Fiat, Brazil, 2007. R. J. Schonberger, “The Vital Elements of World-Class Manufacturing,” International Management, Vol. 41, No. 5, 1986, pp. 76-78. A. Caron, “Technological Innovations in Small and Medium Industrial Enterprises in Times of Globalization: The Case of Paraná,” Thesis (Doctoral in Production Engineering), Curitiba, 2003. R. H. Hayes and S. C. Wheelwright, “Restoring Our Competitive Edge: Competing Through Manufacturing,” Wiley, New York, 1984. D. Buchanan and A. Huczynski, “Organizational Behavior,” 5th Edition, Prentice-Hall, Harlow, 2004. J. S. Oakland, “Total Organizational Excellence: Achieving World Class Performance,” Elsevier, Oxford, 2001. A. L. Digman, “Strategic Management: Concepts, Decisions, Cases,” 2nd Edition, Irwin, Homewood, 1990. J. S. Oakland, “Total Quality Management-Text with Cases,” Butterworth-Heinemann, Oxford, 1995.